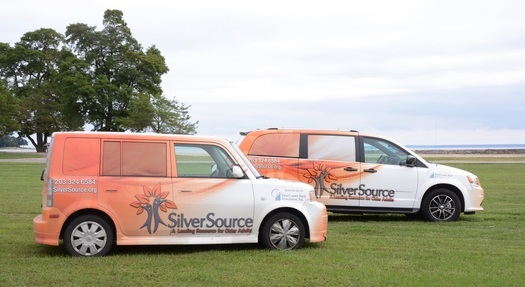 STAMFORD, CT - On Thursday, October 11, Stamford-based SilverSource commemorated a milestone: the expansion of their ‘Ride To Wellness’ medical transportation program to now include those requiring wheelchair transport. A celebration attended by SilverSource Board and staff members, supporters and legislators was held at their headquarters and included a special ribbon-cutting and unveiling ceremony to present the new wheelchair transport vehicle. 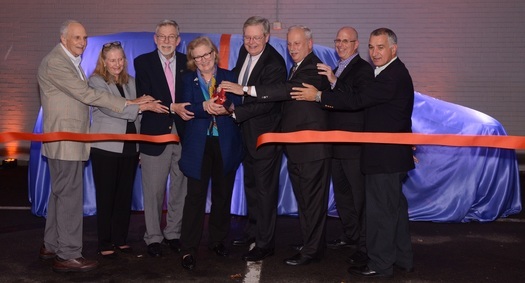 The distinctive orange-colored wheelchair accessible minivan, which can hold up to four passengers, was made possible by generous donations from First County Bank, Purdue Pharma L.P., Rotary Club of Stamford and Thomas Van Riper. The van is the second vehicle in the organization’s medical transportation fleet. Stamford Mayor David Martin and Sen. Carlo Leone joined SilverSource Board Chair Jerome Berkman and Executive Director Kathleen Bordelon, as well as Purdue Pharma L.P.’s Vice President Diana Lenkowsky, Allan Lang of the Rotary Club of Stamford, Chairman and Chief Executive Officer of First County Bank Reyno A. Giallongo, Jr., and Thomas Van Riper in cutting a festive orange ribbon. The SilverSource Ride To Wellness medical transportation program ensures that Stamford’s seniors have access to safe, reliable, affordable and convenient transportation to medical and dental appointments. The round-trip service is provided within Stamford for residents aged 60 and over, and with the addition of this new vehicle, can now include those needing wheelchair transport. “First County Bank and the First County Bank Foundation is delighted to assist Stamford seniors with getting the services they need, especially seniors that have mobility issues,” said Giallongo, whose organization has been providing operational support for the program for over 10 years. To learn more about the SilverSource Ride To Wellness medical transportation program, visit www.SilverSource.org or call 203-324-6584.